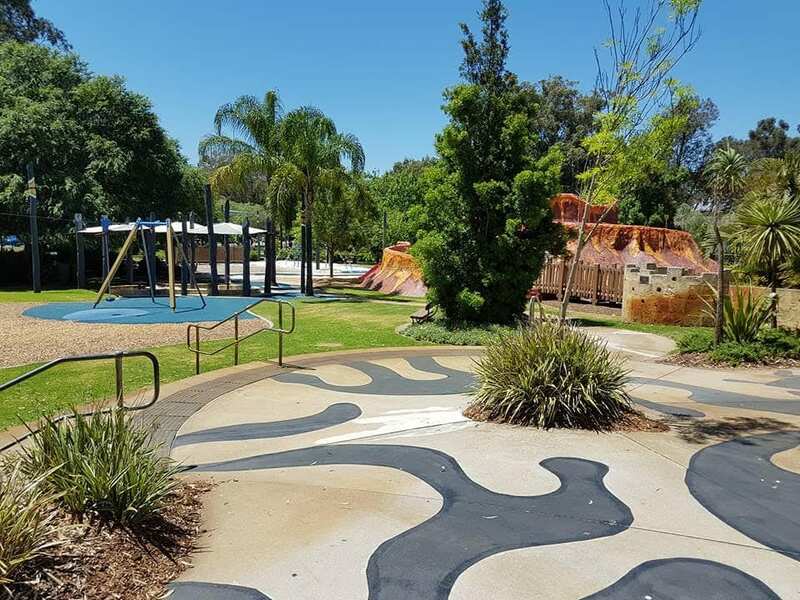 Faulkner Park is better known as Volcano Park due to the large volcano that is the feature of the park. 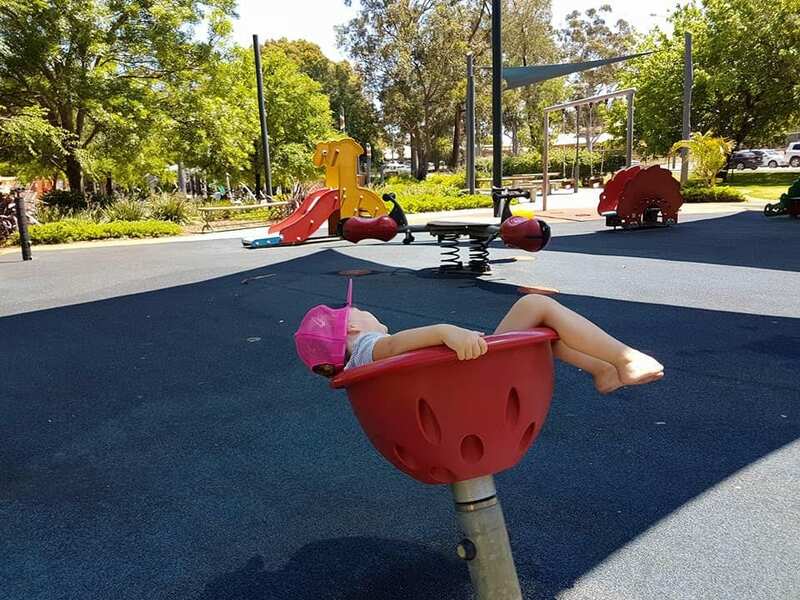 It is quite a large park with a separate area suited to young ones and toddlers, making it a great day out for the whole family. 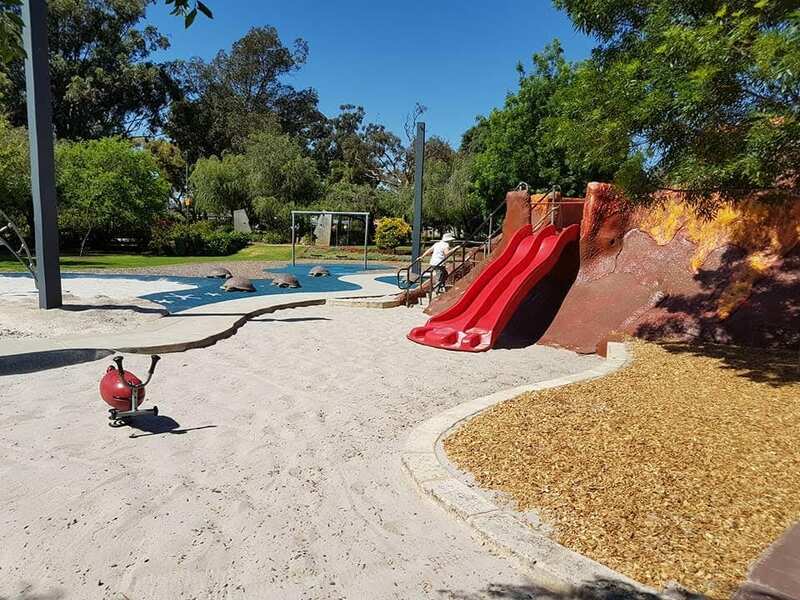 There is water play, sand play, flying fox and plenty of playground equipment including swings and slides. It is fully fenced and has two entrances which are gated with self-locking gates. 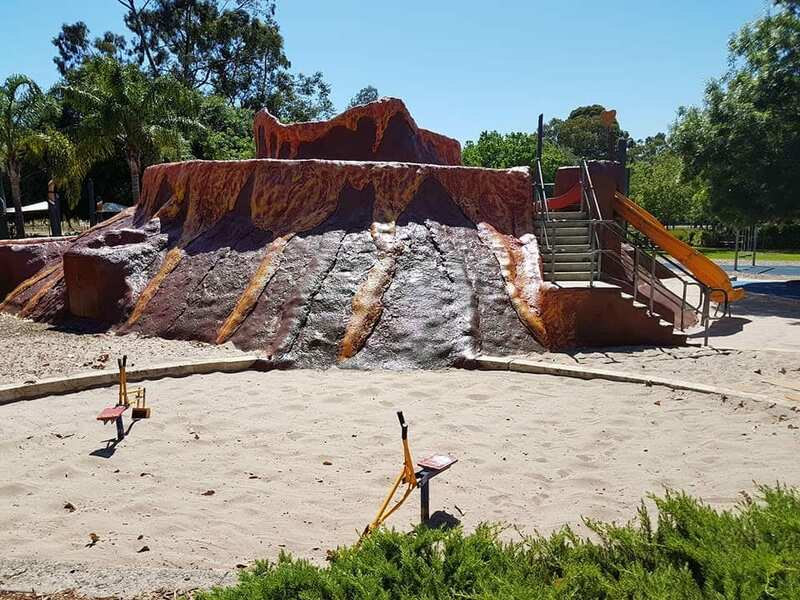 Volcano park was recently closed and reopened on 12 May with brand new equipment installed. 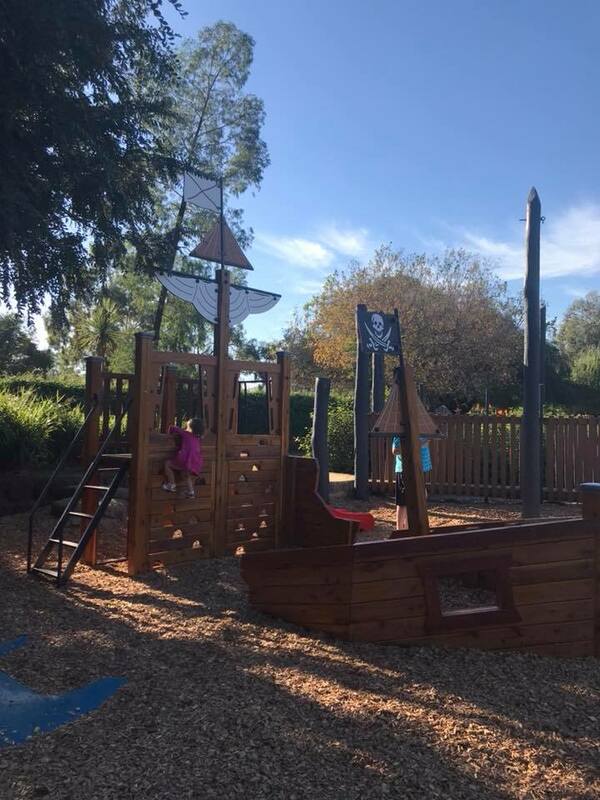 The first piece is a wooden pirate ship play structure. The ship is surrounded by wood chips and is designed so it appears as though it has been broken in two and is stinking. 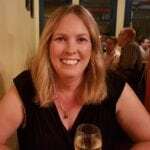 Circling the sinking ship is a crocodile and hammerhead shark! The pirate ship has a climbing wall, ladder and a slide and really helps promote imaginative play. I love that this is bigger than the toddler equipment but small enough for my almost 2 year old to play on and enjoy without problems. The other new equipment is located on the other side of the big volcano and is a couple of sand and water tables. 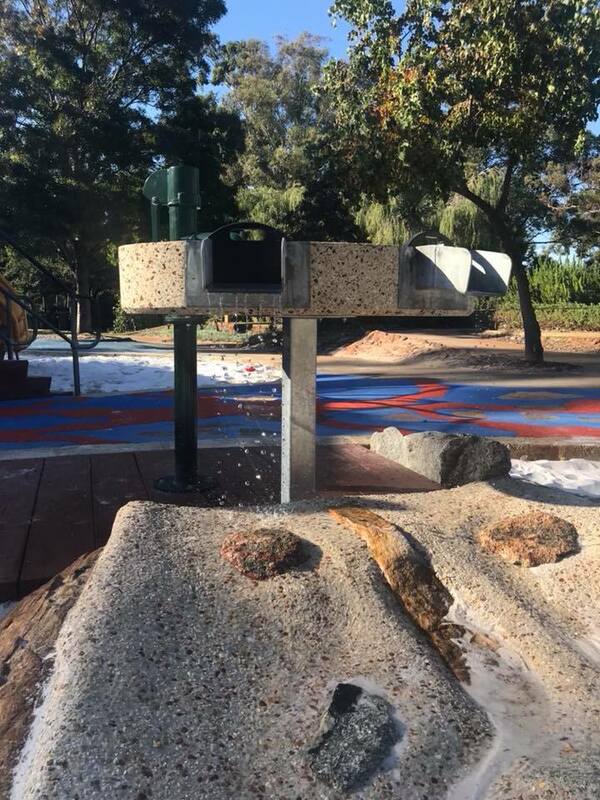 The water has a water pump where you pump the water up onto the table, once ready the little gates can be opened and the water falls out, creating a waterfall, and flows down a rocky path. 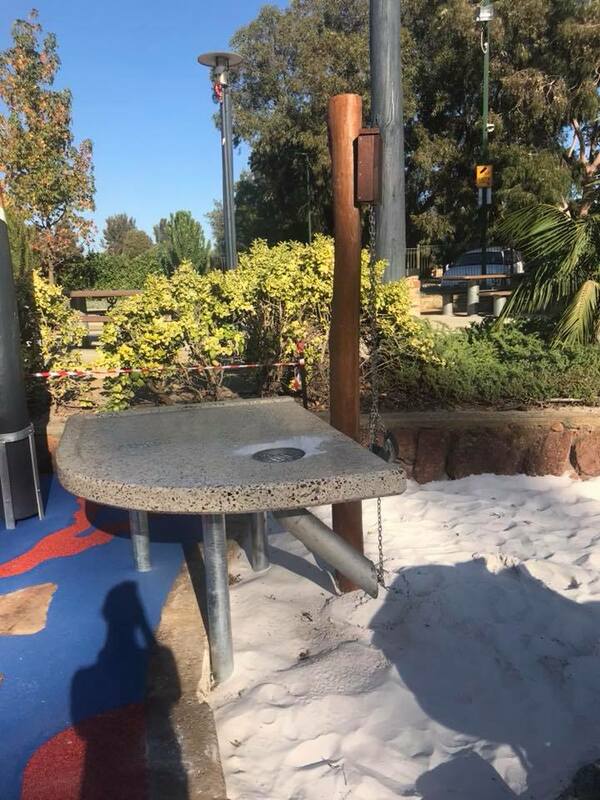 The other table is a sand table where the sand is loaded up at the bottom, hoisted up to the top and then poured through the funnel. I love that these tables teach cause and effect and promote teamwork. The volcano has a wide footpath that spirals to the top or you can take steps part the way. Once at the top there is a good view of the park and also a water mist that emerges from the volcano. The kids can take one of the three slides down. 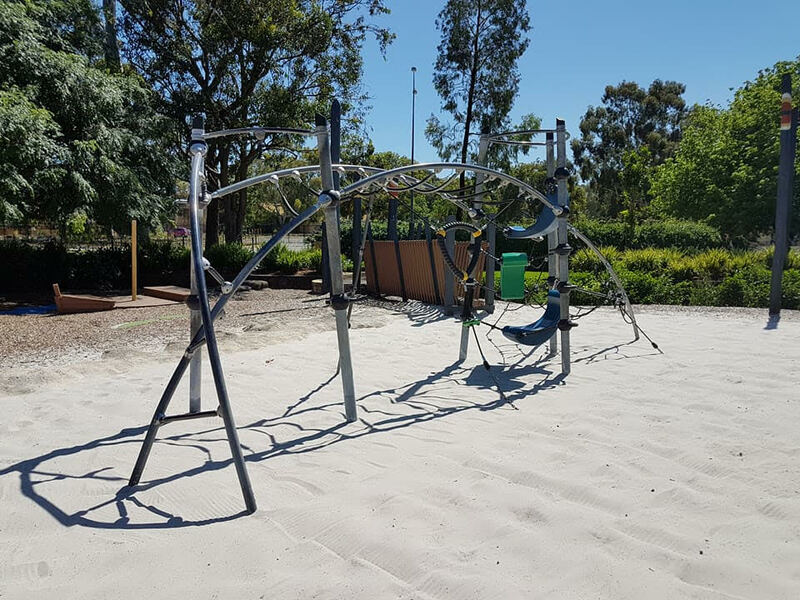 Around the base of the volcano is sand and you will find some sand play equipment like the diggers. There is also a bouncy bug in the sand. There is a little tunnel at the base on one side which the kids enjoyed playing in. There is a family of turtles that live near this too. In this section, behind the turtles, is a double swing set. Near one of the entrances is a flying fox. Unfortunately one the day we visited it was too hot to sit on, even though we arrived early in the morning. 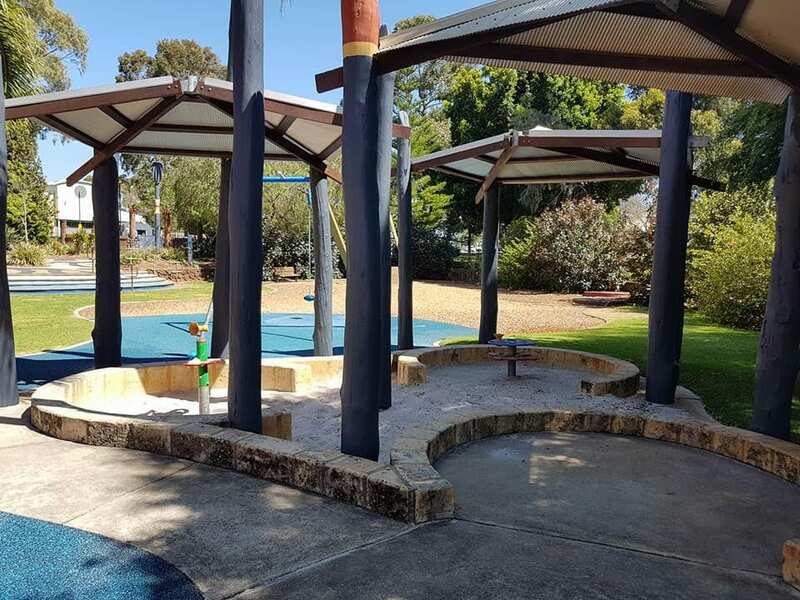 Near the flying fox was a shaded area with sand play. 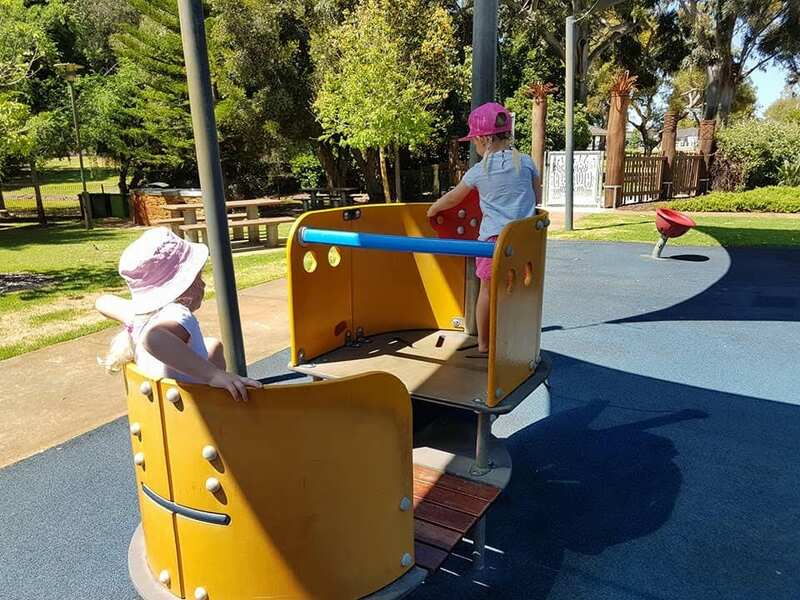 Good to keep the little ones occupied while the bigger ones are on the flying fox. 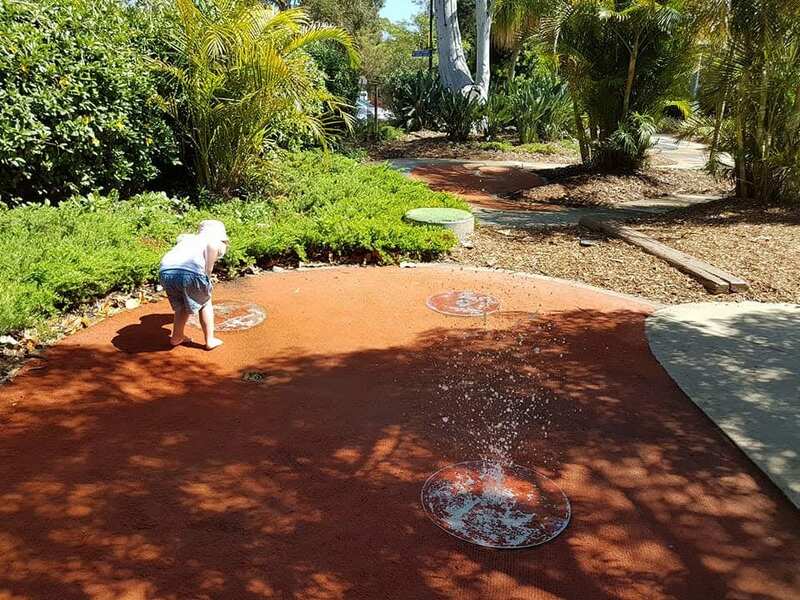 There is also a water play section where water spurts out of the ground on a timer. The kids had fun trying to guess which one was going to spurt water next. There are a couple of pads that they can run between using the balancing logs and stepping stones. If your kids love water bring a change of clothes. 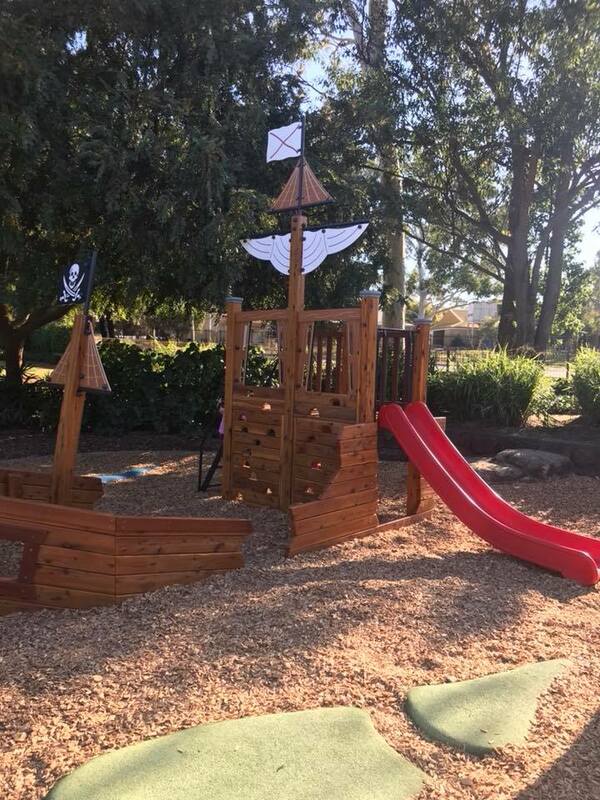 Also for the bigger kids is a climbing frame on sand and nearby a wooden pirate ship and gangplank for imaginative play. There was no shade over the climbing equipment so again it was too hot for the kids to play on. It has rope netting to climb and monkey bars. 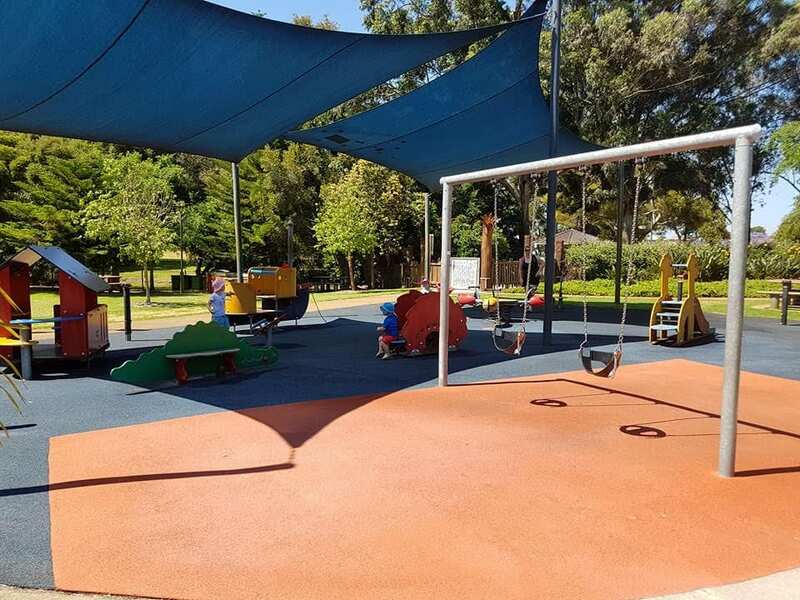 The toddler area is towards the back of the park and does have a gated entrance too. This is the only area of the park that was shaded by shade sails so where we spent most of the time here. It is on soft fall base. The equipment here included a cubby house, spinning bowl, giraffe with a slide, bouncer and more. 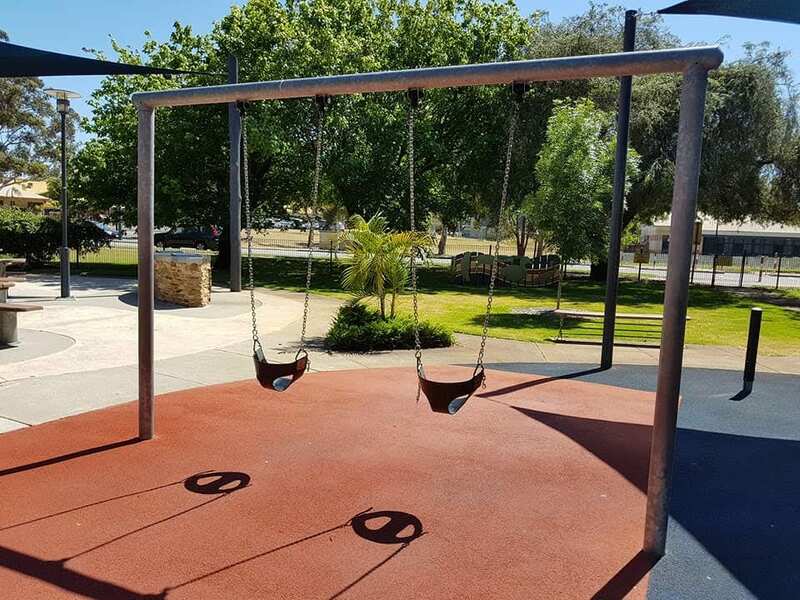 There is also a set of two toddler swings, these were in the front full sun though. 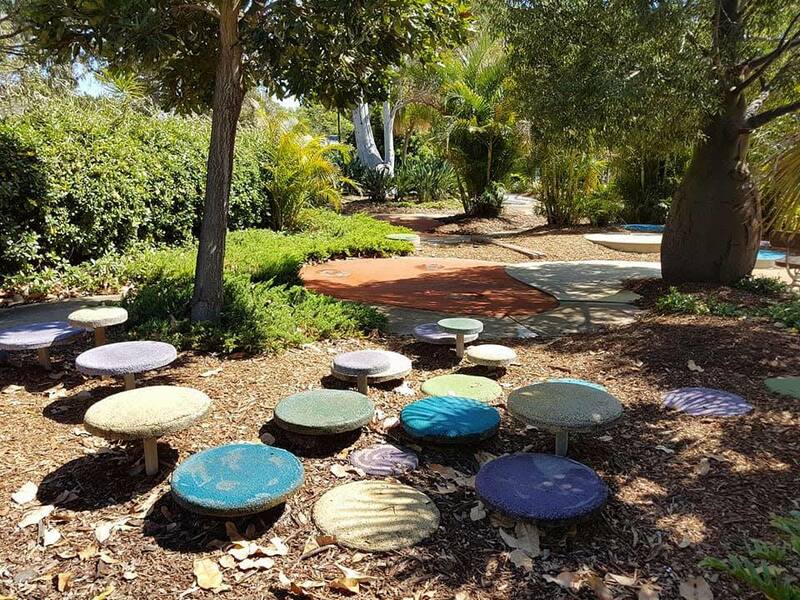 Surrounding the play areas are green grass and shady trees, where you can find park benches or picnic tables. 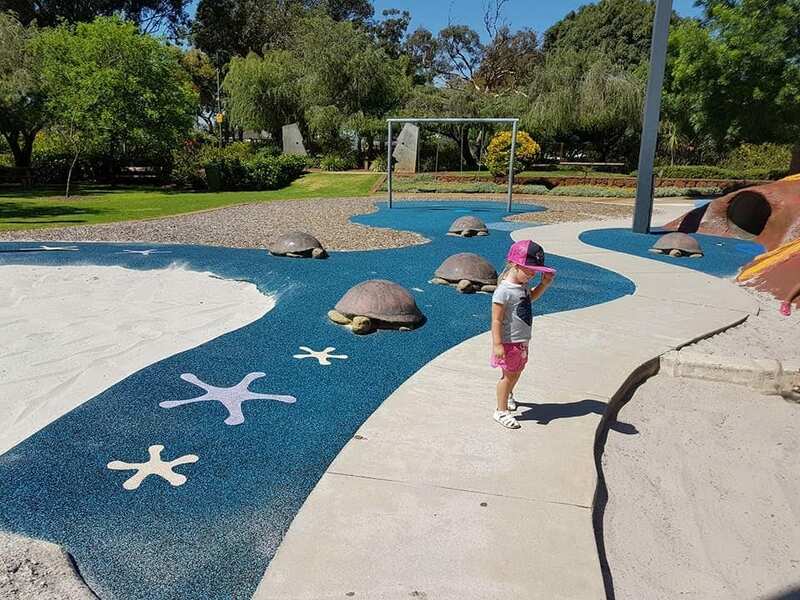 There is also little paths around the edge so if it is busy you don’t have to walk through the main play area with toddlers. 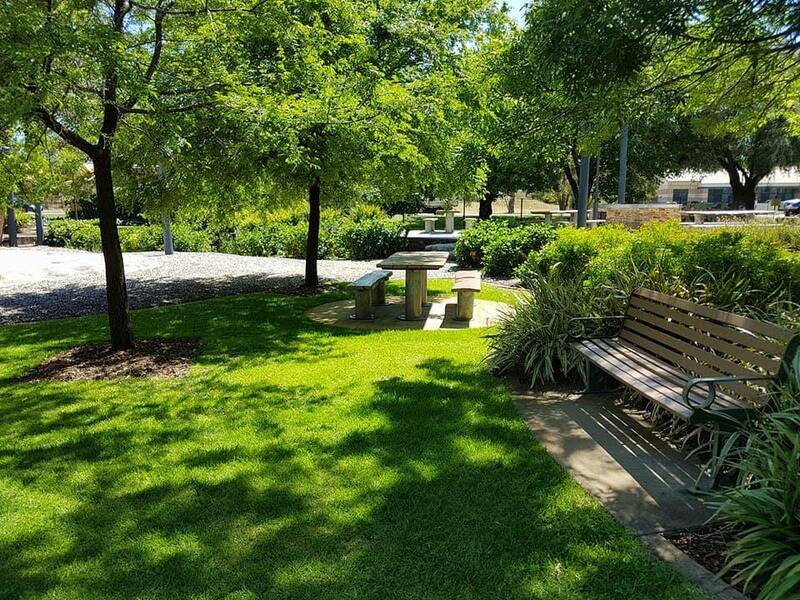 The park is well equipped with BBQs and picnic tables. 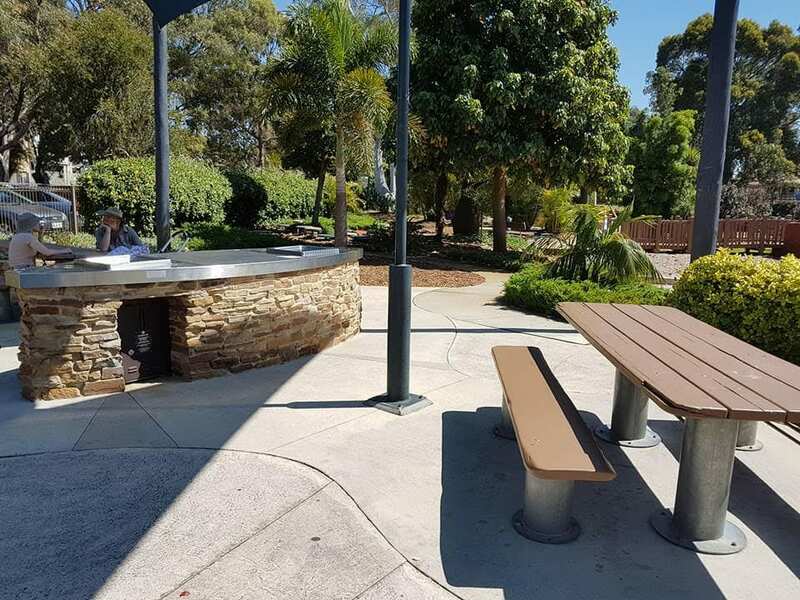 There are BBQ facilities close to the toddler play area and near the front of the park by the volcano and water play area. 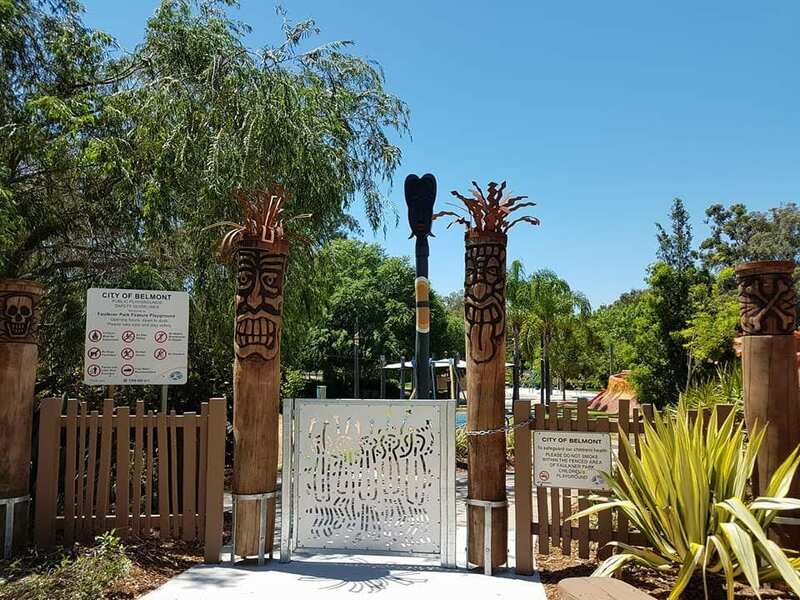 Throughout Faulkner Park there are 3D animals such as crocodiles and turtles and totem poles and tribal heads as points of interest to ignite kids imaginations. 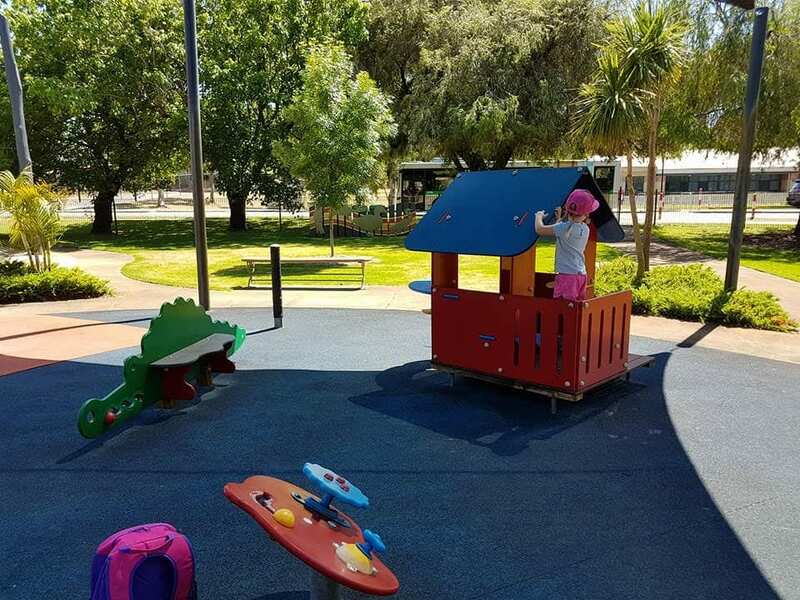 There is very little shade over the main play areas, except the toddler area so if you visit on a hot day like we did some equipment might be too hot to play on. We crossed the carpark and went for a swim at Belmont Oasis after we’d finished playing at the park. 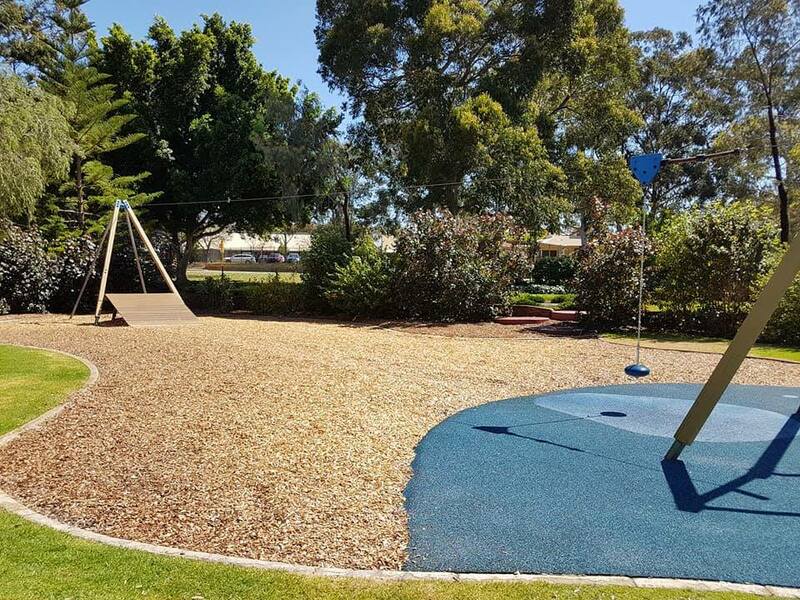 Plenty of parking available and toilets and a cafe are located at the Belmont Oasis Leisure Centre. 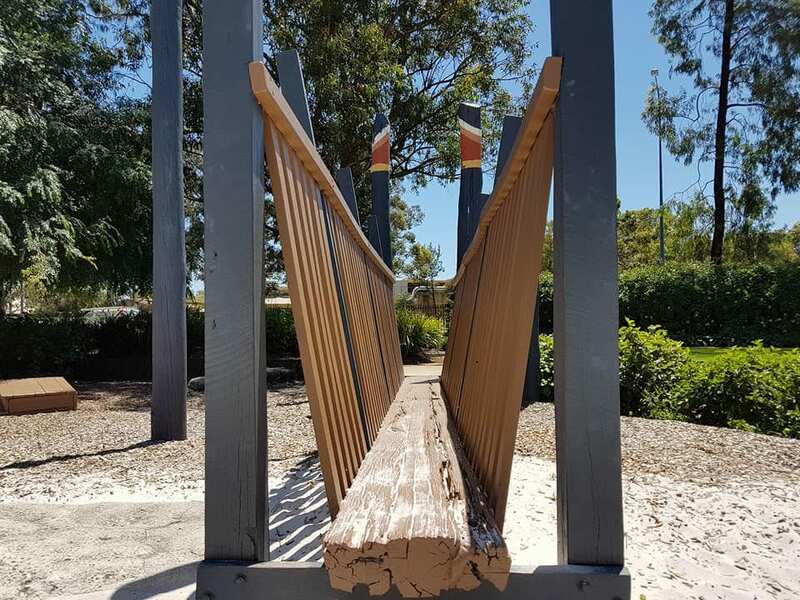 The park is also very close to the Ruth Faulkner Library and Belmont Forum. 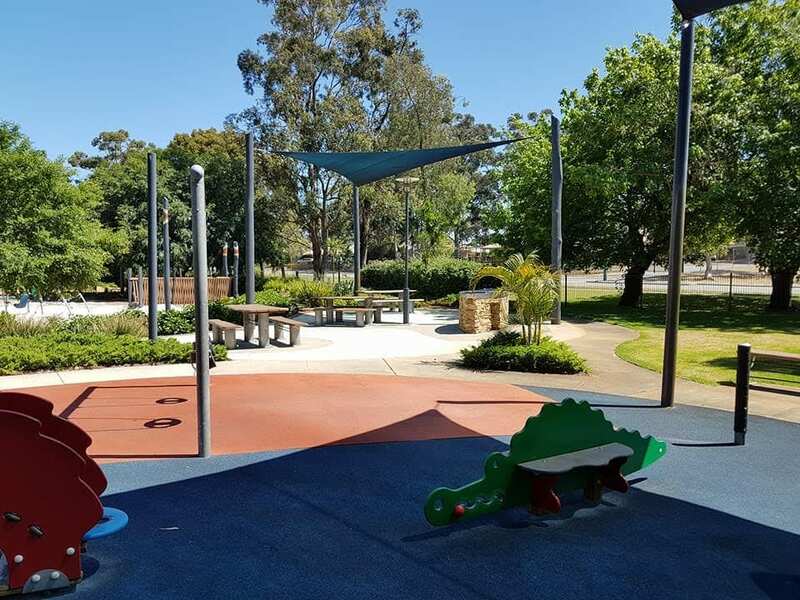 Faulkner Park / Volcano Park, is located on the corner of Abernethy Road and Wright St Cloverdale. The water play is popular on hot days. 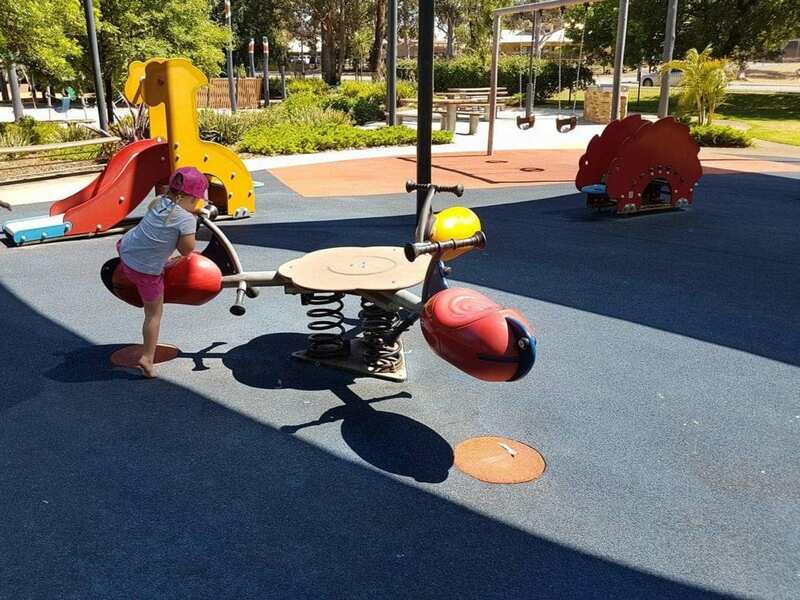 It could do with a little more shade over the play areas. I took my 2 little boys, 5 and 2 at the weekend. 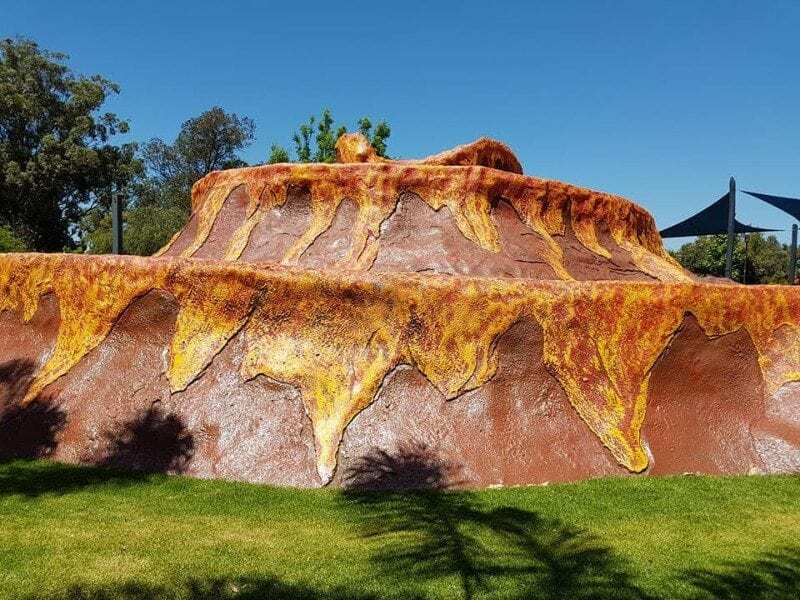 They absolutely loved the park and is a must for any kids who are obsessed with volcanos/lava etc! We will 100% be back here! 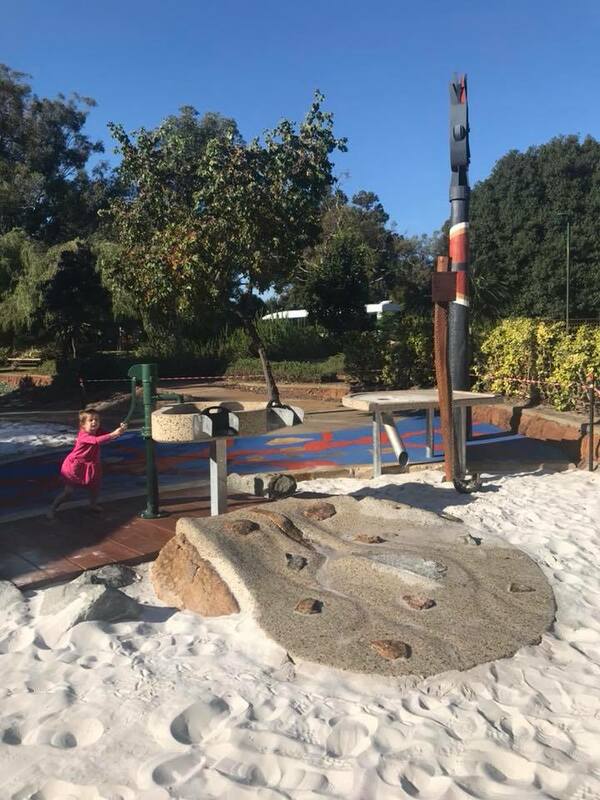 Definitely one of our favourite parks!